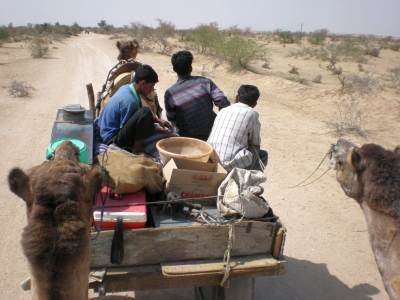 There are surely easier — and less smelly — ways to travel through Rajastan’s Thar Desert. But with a face like that, who could say “no” to a camel? As I bounced around in the camel cart trying to cling on to a bale of half-chewed hay, I was surprised to find myself thinking that I’d actually rather be riding one of these animals. Of course, being sandwiched between two camels, pondering which end emits a worse odor is not the most enviable position to be in, but I never thought I’d actually feel comfortable sitting atop a camel’s hump. Having seen numerous camels pulling carts through Bikaner’s center, I had warmed to them a little, thanks to their seemingly docile nature. And once I realized that they weren’t vicious beasts, I didn’t have to look at too many of Vijay’s stunning photos to convince myself that a night in the desert would be a pleasing respite from the hectic pace of India, even if it did mean riding a camel. So the following morning we arose early and jumped on a truck headed for the starting point of the trek, a ramshackle village clinging to the edge of the desert. It was then that I began to regret my impulsive decision. I’ve always been afraid of animals. Well, four-legged, furry animals to be precise. Put me in a room with a snake, a tarantula or a whole swarm of bugs and I’m perfectly happy, but ask me to touch or much worse ride anything with four legs and fur and I become a gibbering wreck. Which is exactly what happened when I caught my first glimpse of Boss, the adolescent camel that would be my steed for the next 24 hours. But the initial panic that saw me bawling as Boss wobbled and swayed to get to his feet soon wore off. Suddenly I realized that not only had my pounding heartbeat slowed to a normal pace and my hands ceased to shake, but I was actually smiling. Traveling in India is many things: vibrant and lively, hectic and fascinating; but it can also be noisily frustrating. So exploring a traffic-free desert on camelback provided a much needed breather from the traffic-clogged, pedestrian-filled, sidewalk-less streets of the average Indian city. As we left the city, an undeniable calm settled in as the sound of camels passing wind replaced the annoyance of perpetually honking rickshaws, and the sight of hard-haggling traders gave way to a glimpse of resilient blackbuck or nilgai, a sturdy antelope often sighted in these parts. By the time we reached Himdasa — our mid-morning oasis tea stop — a bizarre realization dawned: I was actually enjoying myself. Panic had been replaced by serenity and perhaps a little pride at facing one of my fears head on. So when Boss knelt down to allow me to climb off his back I felt none of the fear that I had an hour earlier. Until, that is, I set foot on the ground and he instantly ran away, much to the chagrin of Mander, the teenage handler whose home we were visiting in this mud-brick village. While Mander chased Boss, his younger brother led us into the simple courtyard of their home for a cup of the milky, insanely sweet tea that we had come to tolerate if not enjoy while exploring the subcontinent. I was feeling refreshed and thoroughly confident when I went to remount Boss, who was safely tethered to a tree having been chased down by an angry Mander. None of the nerves that had plagued me in the morning were present as I attempted to climb aboard, but they all came flooding back when my wayward camel took to his feet before I could even get my first foot in the stirrup, much less sit down. I had no idea I could move so quickly and was surprised to find myself 10 yards from the animal, on the other side of Himdasa’s dusty square. My second attempt was a far less confident one, but at least Boss waited until I was settled in the heavily padded saddle before he stood and continued along the route. The rest of the afternoon passed without incident, though not without enjoyment. The near silence of the desert was disturbed only by the belching, farting and defecating of our steeds, none of which detracted from the surprisingly soothing experience of bouncing along on a hump. Before lunch I even managed to work up enough poise to let go with one hand in order to get a few snaps of the occasional antelope in the distance. Eating in India is always a highlight, but the impromptu feast that our lead guide Kamer rustled up in the middle of the desert was unforgettable. Together with a nearly cold post-lunch beer in the shade of a Khejri tree, and it was utter bliss. Only one thing could have improved this situation and it was then that Kamer came over and informed us that we would now nap for an hour or two until the sun lowered. Perfection accomplished. Following the finest siesta I’ve ever enjoyed, we were ready to jump back onto the camels as they obediently followed the cart carrying our guides and other essentials. The sun was starting to set as we reached our camp and we were thrilled to find a well-stocked shed filled with little extras to make our night in the desert even more comfortable than we’d hoped. I felt more like a wealthy safari-goer than a backpacker as we dined at a table complete with tablecloth and placemats, savoring the enchanting silence as we tucked into another hearty meal of dhal and rice. After a much-appreciated beer and a short and slightly awkward “cultural performance” (theater is always a little uncomfortable when there are more spectators than participants and you’re not sure what the ticket fee should be), we retired early to gaze at the stars and snuggle on to the six-inch thick mattresses in our solitary tent. It would have been a perfect night. The temperature was ideal and there were no partying neighbors or infuriating mosquitoes to deal with. If only the howling dog that appeared from nowhere hadn’t kept us awake all night we would have arisen refreshed and enthusiastic. Instead we awoke grumpy and hating anything with four legs, so when offered the choice to ride back or jump aboard the camel cart we opted for the latter, assured by Kamer that most travelers choose the comfier option on the return leg. Of course, comfort is somewhat subjective, and I soon decided that being jolted around on a pile of blankets atop a camel’s hump would have been more relaxing than sitting on a bag that contained the animal’s breakfast, with the camel in question following close behind looking for his morning snack. 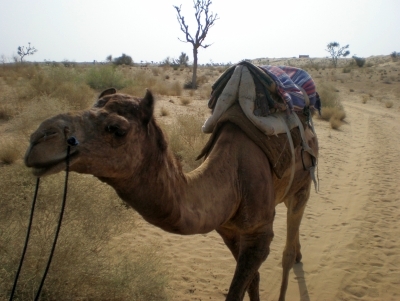 Upon returning I was somewhat proud to find that given the chance to change my mind, I would have ridden the camel back in a flash.